Ava loves playing with her cousins. For the last couple of weeks, she has been able to spend Monday mornings with her cousin Annissa. 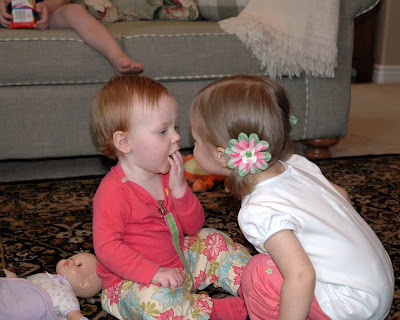 Ava and Annissa are only a week apart and are already great friends. Ava also gets so excited every time she sees her cousins, Luke (Gook), Seth, and Sophie (Baby). A few weeks ago, Seth and Sophie came over to our house to play. Ava had so much fun playing with them. 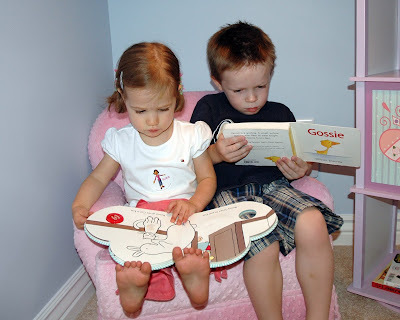 While Sophie was napping, Ava and Seth decided they wanted to read some books down in Ava's little room under the stairs. Here they are both deeply enthralled with their books. 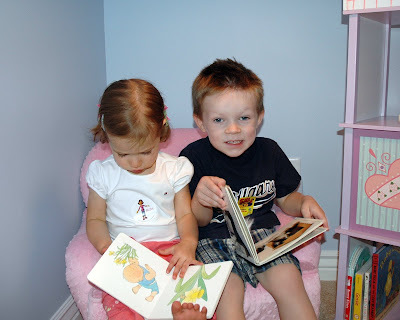 Then, Ava, who totally looks up to Seth, decided that maybe his book was more interesting. 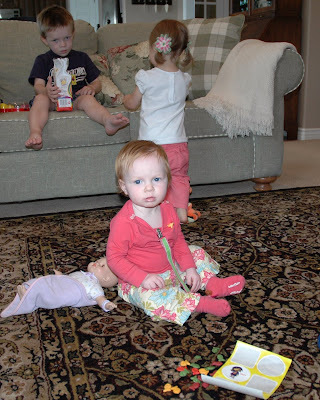 Once Sophie was up from her nap, the three cousins shared their favorite treat, rainbow goldfish. ...so Ava settled for a hug while Sophie, completely aloof, kept eating her goldfish. Ava is so lucky to have such great cousins. Wow, I've never kids so involved in their books. And look! They're even sharing peeks between each other's books!